The Snake 421, "The Best of The Snake Motorcycle Ride"
The Snake 421 is also known as “The Best of the Snake,” and is a sample of some of the best of the combination of roads that make up the rides known collectively as “The Snake”. The series of roads that make up The Snake travels 112 miles and is a heavily traveled Motorcycle and Sport Car Ride. 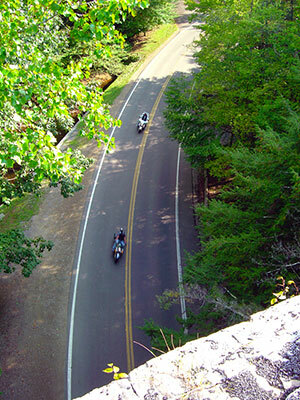 The Snake 421, aka The Best of the Snake, is a really nice 37 mile section of The Snake, offering 489 curves while crossing 3 mountains and traveling through one beautiful valley. It travels through Johnson County, Tennessee and Washington County, Virginia. It is considered by many as one of America’s favorite chartered Motorcycle and Sport Car Rides. This ride has something for everyone from new riders to experienced riders. This is a ride you will want to experience. Blast- new pavement too! Better than the Tail of the Dragon and closer!! Excellent ride. We rode it twice and it is definitely worth the drive up here.